Pink blooms fade to white on Americans favorite snacking apple in late spring. Beginning in September and into October the red crisp, fine textured mildly sweet fruit begin to ripen. Adapts to many soil conditions, this is an easy tree to grow. Pollinates with Cortland, Granny Smith or Yellow Delicious. 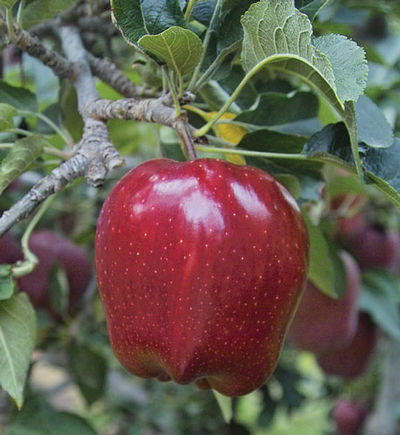 We offer Red Delicious 1"+ caliper in a 15 gallon container. Fruit trees are no longer just for the orchard, consider incorporating them in your landscape. Not only do you have a flowering tree in the spring but the benefit of home grown fruit in late summer and fall.